We need a cider press! 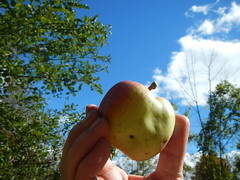 The trees here are huge, in desperate need of revitalization, and full of delicious apples of unknown variety. We are slowly pruning the trees, cutting down the brush around them, removing all of the grape vines from strangling them, and generally trying to get the orchard back into a productive state. What we do know about the apples is that many of them are absolutely delicious. 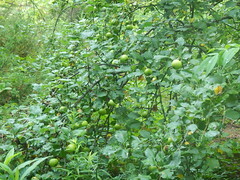 These are old, tall trees, the kind you need ladders and poles in order to pick the apples. 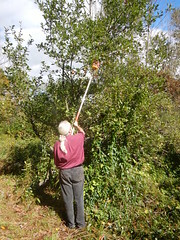 It’s actually sort of fun to do, and it’s the size orchard that we can handle ourselves. It used to be that farming communities could share the equipment required for making apple cider, but things have changed lately. It turns out all sorts of diseases can be carried from orchard to orchard on the pressing equipment. Even bringing apples to a community-owned press is only safe if there is no orchard nearby, so it’s not done anymore, and neighboring farmers no longer offer this service. What we want to do is harvest the apples both in the orchard proper and in the surrounding woods, in order to make the most flavorful cider possible. I’ve done a good bit of research, and decided that the Homesteader model from Happy Valley Ranch seems to be the best fit for our application. It has a heavy duty crusher with a serious flywheel, so you can just pour the apples in, rather than having to constantly worry about jamming. It’s made of laminated hardwood, oak for the stress members and maple for the fruit contact parts. Hardwood plywood and fir really aren’t the same. And finally, it’s big enough and has enough throughput that even in a good year we can press all our apples while still keeping up with the garden harvest and off-farm jobs. We can sell (or drink) the cider as cider of course, but we can also make several other products, like Lisa’s Heirloom Apple Cider Jelly, which is one of our most popular jellies. Usually apple jelly is delicate, almost bland, in both flavor and color, but the stuff she makes with what we get from the trees here is neither. It’s a gorgeous rich reddish almost wine color, and the flavor is amazing. We don’t have the money to buy the equipment outright, so are going to try a crowdfunding campaign, with the perks being products from the farm. Our goal is modest — just shy of $1,000, and we’d love your help! We’ve set up a GoFundMe page here. $5.00: One ounce of wildcrafted herb. Currently on hand are, Blackberry leaves, Black Raspberry leaves and Spearmint leaves. More will follow as the dehydrator runs. 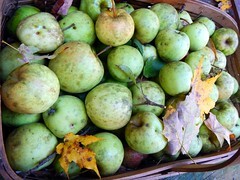 $10.00: One half pint of Lisa’s Heirloom Apple Cider Jelly. Look at the photo up above! This is not supermarket jelly. $30.00: A four ounce mason jar of Plantain Salve. The stuff is fantastic for bites, stings and minor scrapes. It’s more convenient than chewing up a plantain leaf and plastering it on the mishap, made with our own beeswax. 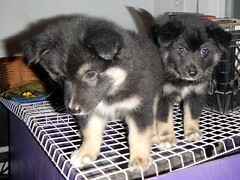 $1500.00: A lovable and loving Icelandic Sheepdog puppy. Cuddly, fetch fanatics, will badger you for a pet kid and herd your sheep and cattle (horses, pigs, tractor, snowplow….). Check out our puppy page to see who is still available. This entry was posted in apples. Bookmark the permalink. Post a comment or leave a trackback: Trackback URL.